What the Beast wants, the Beast gets. Dare’s savage nature has made him an outcast among his kind. The silver-scaled Dracheon warrior can’t control his inner beast. It’s too strong. When his primitive instincts told him his destined mate was on Carinae E, he had no choice. He had to travel to the outlaw planet. There, he hoped to meet a female powerful enough to survive his Drache. He finds Faylee, a delicate little human. Faylee is the best thief on the planet. Everyone she encounters mistakes her for a young boy…except for a tall, shiny warrior from off-planet. When she gazes into Dare’s flame-filled eyes, he makes her feel, for the first time, like a desirable female. The fire-breathing male has her yearning for hot kisses, fierce embraces, and a future filled with love. She doesn’t realize mating with him might be the last thing she ever does. Dare’s beast isn’t the only danger on the planet. An enemy from the past has returned and he’s determined to stop Dare and Faylee…permanently. They’ll need luck and the assistance of every warrior in the Refuge to stay alive. 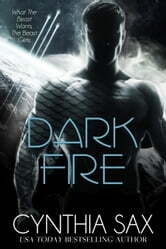 Dark Fire is a STANDALONE SciFi Romance set in a gritty, dark world. It takes talent to take two characters with such dismal backgrounds and tell the story of their love in a way that leaves the reader satisfied and happy for them. They’re not perfect. Each is ‘flawed’ in some way (in the eyes of ‘normal’ beings). But they don’t have to be perfect; just perfect for each other. I love Dare’s and Faylee’s story! It’s a pleasure to watch their story unfold. A little snippet: “His little thief had stolen his heart and his soul...” There are a number of secondary characters I found intriguing as well. Perhaps one or two will show up in future books. Who knows? It is also a treat to see beings from previous books show up here. Great reading! Balvan's arms! You won't believe this! Dare is a being of honour, but has no control over his beast. He left his home planet of Dracheon for Carinae E to find his mate, but will the female want him? Faylee, a little human female, has been a thief all her life, that’s the only way she could survive, she likes shiny things … Dare is covered with shiny silver scales … DARK FIRE is book 4 in Cynthia Sax’s fabulous Refuge series, and while it’s more fun if you have read the previous books, it stands perfectly as a standalone. And readers who enjoy dragons will definitely want to read DARK FIRE because Dare is unlike any other being I have ever read before. And he is HOT, for real! Ms. Sax’s imagination knows no bounds, and in DARK FIRE, she is at her most creative. The romance is fierce, and amazing; the characters fascinating as always, and some secondary characters really impressed me: Overclocked (what a name! ), and Vicuska. The world of Carinae E and the Refuge is so incredibly dark, yet I often find myself smiling because the writing is so witty and clever; a good example is Faylee’s first attempts at seduction. DARK FIRE has romance, action, fabulous beings, and it is also a story about acceptance, about fitting in, about what is considered normal, and most of all about unconditional love and undying friendship. Cynthia Sax never misses the mark! Compelling read. Pretty graphic and gory and felt that the end dragged on a bit - but ended well. Already bought the next book. Wonderful read. I loved the story. I enjoyed the back story of Dare and how 2 "flawed " humanoids could find each other and find their place. Can't wait for the medics story.